Vintage - Lerner, Brown, Plastic, Wood Look, Basket Weave Design, Sewing (or maybe Jewelry) Box with Hinged Lid, Made in the early 1970's. This very nice Vintage Nice Sewing Box by Lerner, was made in the 1970's per the Back Stamp Research. A very nice Brown, Plastic, with a Wood Look, in a Basket Weave Pattern. 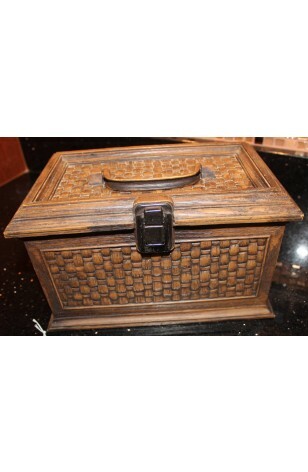 Has a very sturdy Hinge, with Carrying Handle and a dark metal front Clasp. In great Condition, and could be used for a number of other things, such as crafts, recipes, keepsakes, etc. This very nice Vintage Nice Sewing Box by Lerner, was made in the 1970's per the Back Stamp Research. A very nice Brown, Plastic, with a Wood Look, in a Basket Weave Pattern. Has a very sturdy Hinge, with Carrying Handle and a dark metal front Clasp. In Very Good Resale Condition unless noted below or viewed in pictures. Could be used for a number of other things, such as crafts, recipes, keepsakes, Jewelry, etc.